FROM THE START OF THE BLADE TO THE TIP OF THE BLADE IS JUST OVER 19 LONG. THE WHOLE SWORD, THE END OF THE HANDLE TO THE TIP OF THE BLADE IS 23 3/4 LONG. THE BLADE IS A 1842 ARTILLERY SWORD BLADE. PER THE RESEARCH WE HAVE DONE, WE'VE DISCOVERED THAT ONLY 1,000 OF THESE BLADES WERE PRODUCED THIS YEAR, MAKING THIS A VERY RARE BLADE. PICTURE #5 SHOWS THE MARKINGS. PICTURES# 3, 4, & 6 SHOW THE MARKINGS. 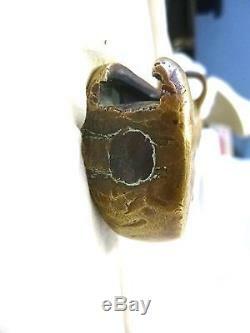 THE HANDLE, HOWEVER, HAS NO MARKINGS (THAT WE CAN SEE). 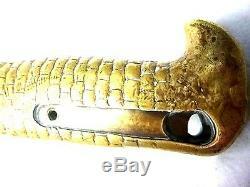 WE HAVE VERIFIED THAT THIS IS A HANDLE THAT AMES PRODUCED. THIS IS A VERY RARE HANDLE TO FIND. THROUGH OUR RESEARCH, WE ALSO FOUND THAT AMES DID NOT START PRODUCING BAYONETS UNTIL 1847 SO THIS WAS PRODUCED 5 YEARS PRIOR TO THE VERY FIRST AMES BAYONET, LEADING US TO BELIEVE THAT THIS WAS AN EXPERIMENTAL PIECE. PICTURES BELOW SHOW SIMILAR HANDLES. THE LAST PAIR OF PHOTOS SHOW ALMOST OUR EXACT HANDLE ON EXPERIMENTAL AMES BOWIE KNIFE/BAYONET. LAST PHOTO SHOWS OUR EXACT HANDLE ON AN AMES BLADE. (SEE LINKS UNDERNEATH PHOTOS TO READ MORE). 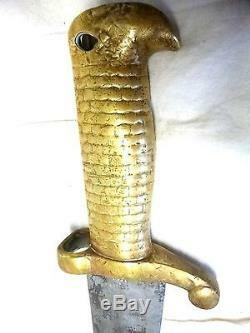 THIS SWORD/BAYONET WAS ALSO GOLD PLATED AT ONE TIME (SEE PHOTOS). AS YOU PROBABLY KNOW, AMES WAS ALSO A PLATING COMPANY, SO AT ONE TIME THIS SWORD/BAYONET HAD TO HAVE BEEN A VERY SPECIAL SWORD/BAYONET. 95% OF THE GOLD PLATING IS NOW WORN OFF DUE TO THE FACT THAT THIS SWORD IS 172 YEARS OLD! 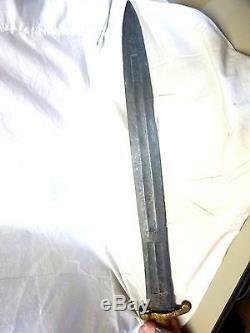 WE BELIEVE THAT THIS IS AN EXPERIMENTAL SWORD/BAYONET PUT TOGETHER BY AMES. AMES TOOK ONE OF THEIR RAREST BLADES. (AGAIN, ONLY 1,000 WERE PRODUCED). AND TOOK ONE OF THEIR RAREST HANDLES AND PUT THEM TOGETHER. BUT NOT ONLY THAT, THEY HAD IT GOLD PLATED! THIS HAD TO BE A VERY SPECIAL SWORD AT ONE TIME! IT WOULD BE A GREAT PIECE TO ADD TO ANY COLLECTION! I TRULY BELIEVE THIS IS A ONE OF A KIND SWORD! 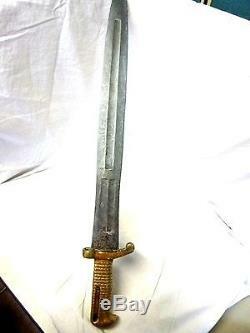 IF THIS SWORD/BAYONET WAS IN BETTER CONDITION, I WOULD ASK TWICE AS MUCH. THIS WOULD BE THE JEWEL OF YOUR COLLECTION. AS-IS NOT TO MENTION IF YOU WERE TO HAVE IT RESTORED! OTHER HANDLES MADE BY AMES SIMILAR TO OUR HANDLE. These are some handles we've found during our research that very closely resemble to our handle, if they are not exactly the same handle, made by Ames. Last photo is an exact picture of our handle, produce by Ames, on an Ames blade. 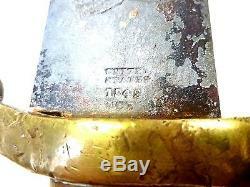 This is a very similar handle made for the US Navy by Ames. Our handle does not have the stamp or the same locking mechanism as this sword but the "eagle head" shape and the "feathering" pattern on this handle are very similar to ours. 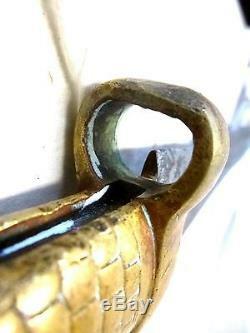 This is basically the EXACT same handle that we have on our sword/bayonet. Same locking mechanism setup, same shape, same pattern, everything - Dead on. This handle has the same stamp as the first one did that ours doesn't have. It also has a slightly different locking mechanism from our and the first. But this is still a VERY similar handle! This handle is actually the handle of an "Experimental" Ames Bowie Knife Bayonet! This Handle is Built almost Spot on like ours. 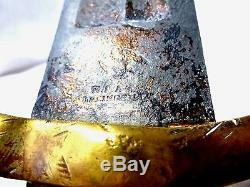 This one was found on this professional's website, On an Ames Bayonet! This is our EXACT HANDLE. Same shape, Same Pattern, Everything - Exactly. 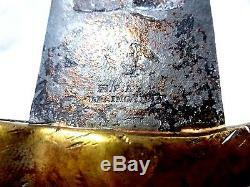 This one was found on this collector's website, Also on an Ames Bayonet. THROUGH FURTHER RESEARCHED CAUSED BY A SUSPICION WE HAD FROM PHOTO #7' S HANDLE WE'VE COME TO REALIZE THAT IT LOOKS LIKE IT HAS BEEN STAMPED. 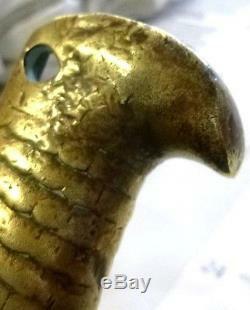 WE BELIEVE THAT THERE IS THE 1842 ARTILLERY SHORT SWORD STAMP, THE EAGLE (PICTURED BELOW). ALSO, IF YOU LOOK A LITTLE CLOSER YOU CAN ALMOST MAKE OUT ANOTHER STAMP UNDERNEATH THE EAGLE, A CIRCULAR STAMP, WE BELIEVE COULD POSSIBLY BE THE STAMP OF THE U. NAVY IN THAT TIME PERIOD. PLEASE TAKE A LOOK AT PHOTO # 12 FOR A CLOSER LOOK THERE YOU CAN MAKE OUT THE WINGS AND HEAD OF THE EAGLE, AND THE SHADOWS SHOW HALF OF THE POSSIBLE CIRCULAR STAMP ALSO. Hi, one more thing, if this was a put together sword/bayonet, I would think someone would have used a more common ames handle. Why would someone take a very rare ames blade and then put it on a very rare ames handle? The item "ONE OF A KIND! 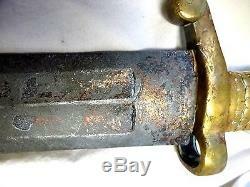 AMES ARTILLERY SWORD/BAYONET EXPERIMENTAL US MODEL 1832 BLADE" is in sale since Wednesday, April 30, 2014. This item is in the category "Collectibles\Militaria\Civil War (1861-65)\Original Period Items\Edged Weapons". The seller is "bdonnellan2012" and is located in Lakeland, Florida. This item can be shipped to United States.